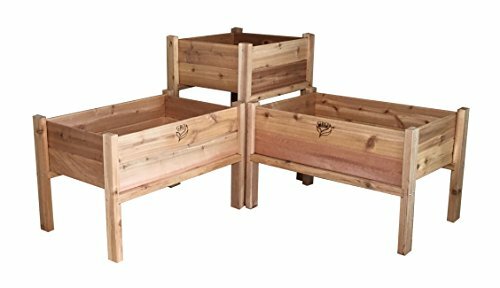 The GRO Products Elevated Garden Bed Combo is a perfect combination of planters to make your garden spectacular. This combo includes one 34" High square planter- 24" x 24" and two 22" High rectangular planters- each 24" x 36". They are made from quality Western red cedar. Assembly is quick and easy and will have you showing off your green thumb in no time! Made in the USA. GRO Products is Family-owned and -operated, GRO Products has been manufacturing outstanding cedar products since 1984. All products are proudly manufactured in the USA. GRO Products continues to provide gardeners everywhere with specialized and innovative items to take their gardens to new heights!. Please click on the Gro link at the top of this page to learn more about Gro Products. Great way to garden; no bending over!